So the basic setup is a 10 gal aquarium setting on a couple of mirrored tiles. I lit it from above with my 580 speedlight using an off camera shoe. The trick was to overcome the buoyancy of the peep. I did this by impregnating it with several of those little interchangeable screwdriver bits. 3 was about all I could fit in without poking out, and that was enough weight to make a splash. I took about 60 shots to get this one. Sadly, 7 peeps made the ultimate sacrifice for this shot. The rest are about to make the ultimate sacrifice for my sweet tooth. That's some heavy marshmallow. I guess it's weighted or yanked down with a thread. Good stop-motion. A good spoof of the traditional splash shot. I assume you had to weigh the peep down to get a good splash from it? Was wondering when one would be here...lol. Awesome job!! Ah, yes, there had to be a splash photo in the contest. And a splash photo done well, too. Amazing shot. Didn't know peeps were so heavy. Nice, clear exposure. Too funny!!! 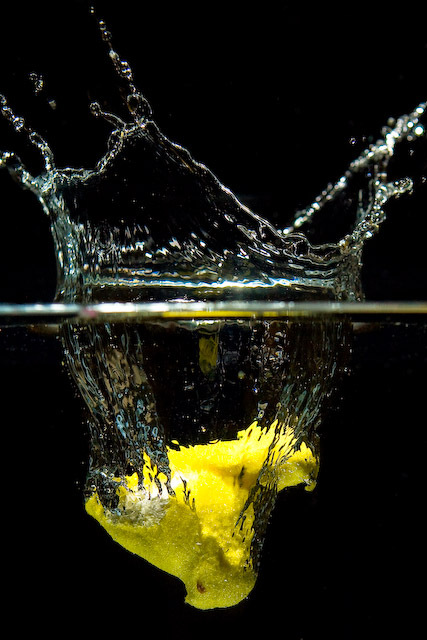 Every challenge needs a "splash" shot!! Proudly hosted by Sargasso Networks. Current Server Time: 04/18/2019 08:27:30 PM EDT.